Yesterday we had four talks at one school as well as a writing workshop with a talk there as well. We didn't finish until 9:30PM and then we had to drive from Portland to Auburn, WA! We didn't arrive to our host family's house until around 1. Today we had only one school event and a dinner with some fans. I got to see a good friend of mine who I haven't seen in awhile. I updated the tour blog more, so you can read more details there, though not of these days yet. We had a school event and a writing workshop today, bringing my total to 25 talks. I hope you all are having a wonderful day. I am rather tired, and I'm going to bed. Tomorrow is another school event and another writing workshop. Hello from Grant's Pass, Oregon! They were pretty slow, we think it was because of the nice weather. In other news, the Amazon Blitz went amazingly. :) My amazing readers brought the ranking of Precisely Terminated up to 1,897! Wow! Precisely Terminated Amazon Blitz is TODAY! 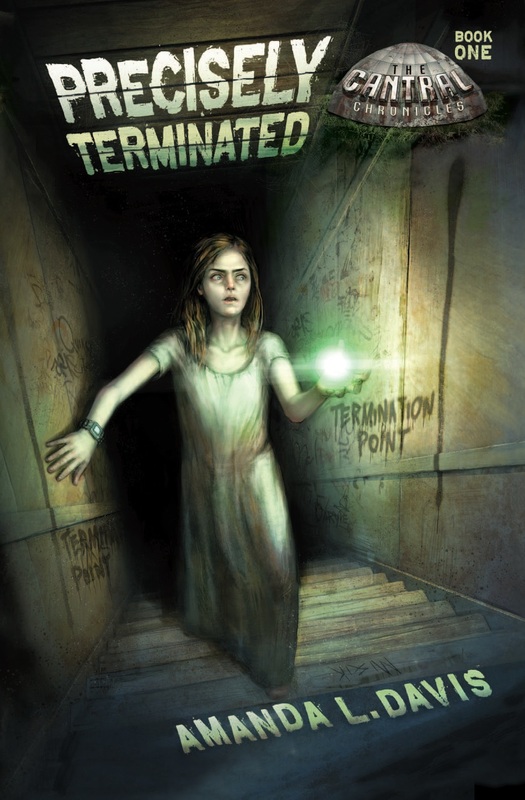 Today is the day to participate in the Amazon blitz for my book, Precisely Terminated. Click here for details. My dad and I are at the Redding Public library right now in the middle of a writing workshop. I just finished speaking, and I'm working on Noble Imposter, Precisely Terminated's sequel while my dad speaks. We're heading to Medford, Oregon tonight, four hour drive, should be fun! Today we had mostly a day off. We spent the morning at a friend's house catching up on things before heading to a school. We had a speaking event before driving to Napa, CA. We're here for a day and a half until heading north again. Today we visited a church with a fan and his family before having a book talk at another fan's house (along with their large group of friends) and then another talk at a church. Sorry for being so lax on posting here. I've been rather busy with this tour, and I've been updating the Davis Crossing Tour blog every day. So here is my total event count. We've been rather busy the past few days, getting up at 6AM and staying up until 12AM. Noble Imposter, the sequel to Precisely Terminated isn't growing very quickly because of this delay, but I think I can still get it turned in on time. We'll be keeping track of our day to day mileage and the trip total as well. Today we traveled around the Dallas, Texas area. First we visited a home school group, then a Christian school, and then a youth group. Our first stop was in Watauga, Texas for a writing seminar with a homeschool group. My dad did most of the talking at this one, but I did a short little speech in there, too. After the co-op group we rushed off to Prince of Peach Christian Academy in Carrollton, Texas. This school was very receptive, we spoke to the 3 - 8th graders, I believe. One family drove out to see us from Oklahoma! Three hours away! After Prince of Peace we stopped for dinner before trekking to a friend's house and hanging out with them for a bit. Funny enough, I forgot to take a picture of them, but I did get a picture of their cat, Lily! It took us awhile to get back to the hotel because our GPS decided to suddenly freeze and not tell us anything for a few minutes. We had to reboot it before it would do anything. No idea why it did that, but now it's fine again, we're safely back at the hotel and I am going to bed. We do have a video coming up, but it's too late to be doing that tonight. It has our 'word of the day' in it, too. Read more about that in the contest rules. :) I hope to post the video tomorrow. I'm going to be reposting updates from my dad's and myauthor blog here. Today is the first day of the Davis Crossing Tour! Of course all we’re doing today is traveling, but one must do that to get to events. J Unfortunately, our teleporter is currently out of commission. My hippopotamus sat on it. You can see his picture later in this post. I washed the van this morning so we could put the nifty tour magnets on the side. Then I had to get cleaned up just 15 minutes before we pulled out of the driveway. Hence why my hair is wet in these pictures. All packed up and ready to go. Like our snazzy shirts? We didn’t leave until around 11AM this morning because it’s only eight hours to Dallas, our destination, and we haven’t any events until tomorrow at 9AM. The morning hours were spent with last minute preparations. We had to unpack the van and pack the trailer because it was deemed that the van could not hold all the weight, though everything did fit inside! So we’re bringing the trailer with us on all our stops in the USA. We’ll have to leave it in Seattle when we go to Canada—too much of a hassle to bring across the border. and my dad is holding Vinnie, the official tour rat. We passed through Mississippi first, but I failed to get a picture of the welcome sign, sorry. I did, however, get a picture of the Tennessee welcome sign when we reentered TN on our way to Memphis. That’s the way the route goes. As I am writing this blog post, we are driving through Arkansas. We saw a crop duster plane a few minutes ago, which was interesting. It’s cool to see them swoop over the fields and turn around for another pass. Today’s state count will be four once we reach Texas. Four if you count Tennessee, that is. Some people might not, seeing as it’s where we started, but I do. It is a state after all. I hope to see a lot of people at our events tomorrow! In just five days my father, Bryan Davis, and I will embark on a 2 1/2 month long book tour. I plan on living off of Dr. Pepper and Reese's Cups most of the time. We leave on September 13th for Dallas, Texas with three school visits on our first official day of the tour, September 14th. Now, since I am a first time novelist, I have never really given author talks, or writing seminars, or spoken in front of hundreds of people, so this will be very interesting. At home I am naturally a quiet person. I spend my days sewing, spinning, or writing, and rarely say much of anything verbally, so my voice is not very loud or strong. If I talk for more than 20 minutes, I get a sore throat, if I have a 1 1/2 hour conversation, I lose my voice. That being said. This is going to be a very fun experience, getting my voice into shape. My dad, on the other hand, can talk for 5 hours and be fine. After seven years of touring and giving author talks, that's as it should be, yes? On this tour, we will be traveling to approximately 31 states and British Columbia. Ever heard of an Amazon Blitz? It's where a group of people buy a specific product (usually a book or movie) on a specified day to help boost that item's ranking. Boosting a ranking helps the item get recognition by people who are perusing Amazon and helps the author get known (If it's a book). Activity: Buy Precisely Terminated at Amazon.com on that date. Reward: If you email me on September 24 with proof of purchase from Amazon, I will send you an autographed adhesive label to put in the book as well as a bookmark. The label will have a graphic of Precisely Terminated on it. You'll also get a big hearty THANK YOU! Proof of purchase can be the email Amazon sends you to confirm your order. I will try to be on my author page, doing Q&A and posting ranking updates during this event. Please come and hang out and ask questions.